Ethereum, TRON, and Iota have outperformed most other major cryptocurrencies by the 30-day Sharpe ratio, a measure developed by Nobel laureate William F. Sharpeto evaluate the return of an investment relative to its risk. Meanwhile, Bitcoin’s performance was dismal. Within the last 30 days, the market has experienced a robust recovery after bottoming out in December. One indicator, the Sharpe ratio, calculates the performance of an investment adjusted for the risk-free interest rate per unit of volatility. To calculate the Sharpe ratio, first, the risk-free rate is typically determined using U.S. Treasury Bills as a zero-risk benchmark. Then, over a given period of time, the rate of return of an investment is calculated. The risk-free rate is subtracted from the rate of return of the investment to produce the amount of excess return. Finally, the excess return is divided by the standard deviation (volatility) to produce the Sharpe ratio. The greater the returns over the risk-free return, the higher the Sharpe ratio. More consistent returns over time also produce a higher Sharpe ratio. Meanwhile, a negative ratio indicates that the return on investment was lower than the risk-free interest rate in a given period. For comparison, U.S. Treasury Bills have a Sharpe ratio of zero. 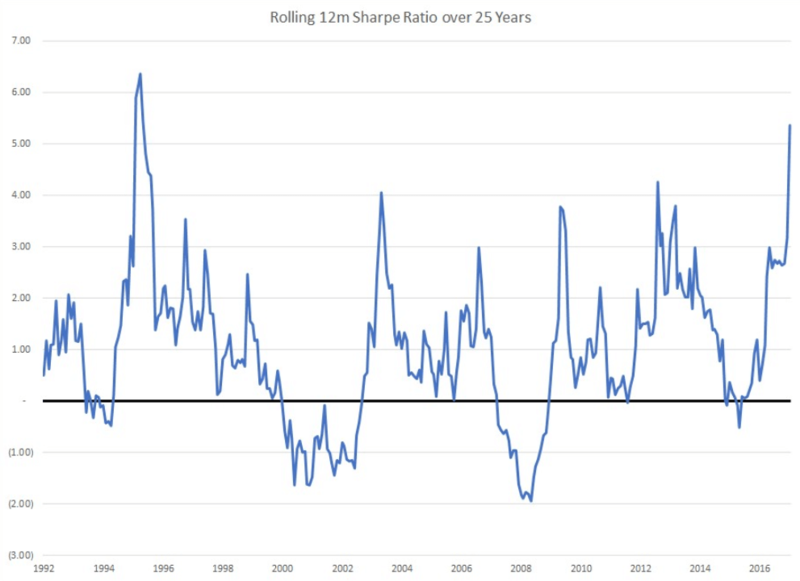 The S&P 500, an index of stocks from the largest 500 U.S. companies, had a rolling 12-month Sharpe ratio of approximately 1.0 over the last 25 years. 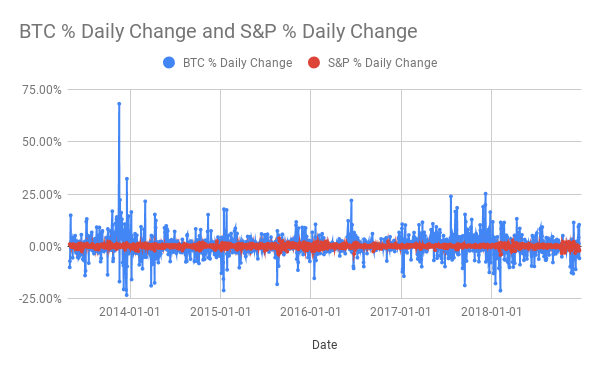 The chart emphasizes the extreme levels of volatility experienced by bitcoin, even when compared to a moderately volatile index, such as the S&P 500. Ethereum and Iota generated Sharpe ratios of 0.124 and 0.127, respectively. TRON lead the way with a ratio of 0.169. Over the last month, Bitcoin had a dismal ratio of -0.0722, indicating that U.S. Treasury Bills outperformed the cryptocurrency in the last 30 days. These figures have little to no bearing on how the cryptocurrencies in question will perform in the following months. Whether the Sharpe ratio has any relevance for evaluating the merits of a cryptocurrency is another matter entirely. The new asset class is new enough and volatile enough that the ratio may not provide any useful information—but we’ll let the analysts in our audience make the final decision. Stellar’s blockchain facilitated 1,024 transactions on December 30th, an average of 42 per hour. Ripplefacilitated 396,354. Comparatively, Tron processed 2,845,490 transactions during the same period, and Bitcoin did 267,463 – all according to Coinmetrics.io, which tracks such information. Deposits and Withdrawals are live now and the trading will start at 06:00 PM IST, 26/11/18. TRON is aiming to bring blockchain and file sharing together with their latest venture, Project Atlas, which will blend blockchain technology with BitTorrent’s massive peer-to-peer infrastructure. TRON acquired BitTorrent in July 2018, along with its 100 million active monthly users. BitTorrent is an established peer-to-peer network with a developed and tested infrastructure, but only time will tell how well the collaboration will work. It’s an intriguing move, but what does it mean? Peer-to-peer file sharing has always been a popular way of exchanging information and media online, with around 27 million people using it to share or download files every day. It’s clearly an important space and dates back to the early days of the internet. File sharing advocates are quick to call attention to its value in promoting democracy, openness, and the free exchange of ideas. Its detractors, of course, will point to the misuse of file sharing and torrenting platforms by pirates and criminals. Still, many projects in the space are committed to making the internet a fairer and more decentralized place, where users can interact directly with one another instead of relying on centralized third parties. In this sense, it has something in common with the world of blockchain. Project Atlas is an attempt to fuse the two spaces, with the aim of improving how file sharing works. The aim is to improve the way BitTorrent works by introducing blockchain technology and tokens. BitTorrent already has reward systems in place to encourage users to share files for longer and be responsible members of the community, but TRON hopes to use tokens to further this. The system will use tokens to reward users who seed files for longer and use faster nodes, as well as those who share more of their bandwidth and storage space. This way, they hope to increase download speeds and make the file sharing experience smoother and more pleasant. It’s also backward compatible, which means the original BitTorrent software will continue to work while new changes are being made. The team has promised to keep BitTorrent products free, which should be a relief for the software’s user base. The project could help encourage more responsible usage of torrenting and improve user experience. On the other hand, torrenting has found it hard to shake off its shady reputation, and turning this around could be a challenge.